Use ClamAV to scan entire PC, including Windows Partition! Although Linux is less vulnerable to Virus infection, it is generally a good idea to still regularly scan entire PC, especially in a Windows-Linux dual-boot PC. Let’s take a look at how to perform a virus scan in an Ubuntu PC using ClamAV opensource antivirus program. Using this guide one can scan Windows partition too to remove the virus. This guide is tested on Ubuntu 17.10 but should work in older versions of Ubuntu, Linux Mint, and elementary OS too. ClamAV is a popular free and open source software (FOSS) that is used for cleaning up malware from various situations including email scanning, web scanning, and endpoint security. It provides a command line scanner and an advanced tool for automatic database updates. Its Virus database gets updated multiple times per day. Launch ‘Terminal’ (keyboard shortcut: <alt><control><t>) and enter the following command. Pay attention to the Terminal and enter the root password and ‘Y’ when you see a prompt to complete the installation. Next, you should update ClamAV virus database with latest so that the scanner can detect the recent malware too. Use the following command in the Terminal. Did you see an error that resembles the following? The error indicates that ClamAV is currently running in the background. You need to stop the program before installing updates. Time to update the virus database now. ClamAV operates only in the command line. Therefore, it’s important to know what commands are available with it. 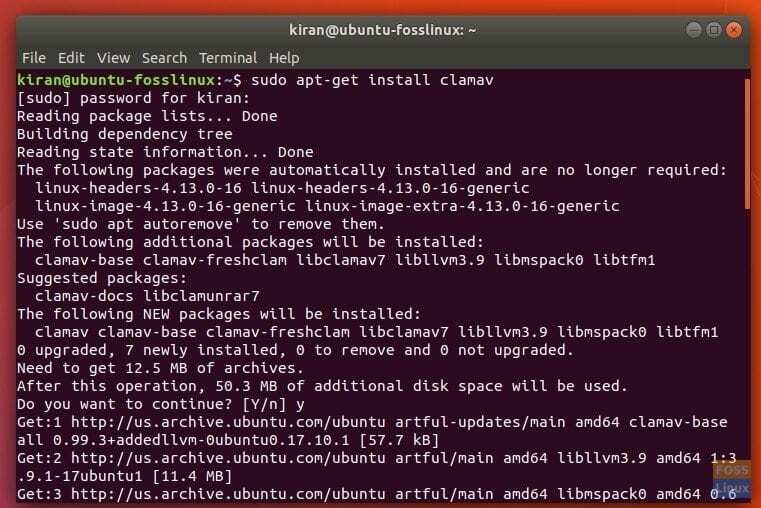 To know the complete list of commands for ClamAV, enter the following in Terminal. Enter ‘q’ to come out of man window. You will not see any progress in the terminal and may look like it’s not responding, but it is completely normal. ClamAV reports the summary after the scan is finished. Very useful site for newbies like myself. Thanks a lot. Please guide me or give some solutions to scan malware on Centos. I am use VPS on Vultr and my website have get malware, some malware for SEO from attacker. How I scan and remove it from VPS. Not a programmer but love using Linux, no more Windows for me. Thanks so much for this extremely useful and important information.